Last week I had an exclusive interview with Yu Heng ( 宇珩 ) who is the newly appointed Freshel's Malaysia Ambassador. 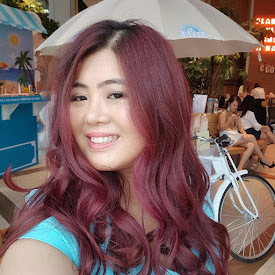 Yu Heng a very talented Malaysian songwriter & singer hailed from Bentong, Pahang is now based in Taiwan has written many songs for herself and other singers including Z-Chen, Twins, Fish Leong, and Ding Dan. Yu Heng said that she is happy with her collaboration with Freshel Malaysia because she finds that Freshel skincare really works for her. She said that she doesn't like to complicate things and prefers to keep things simple. When it comes to beauty, the most important thing to her is hydration. Personally I have tried some of their skincare last year June and do think that their products are pretty simple to use and glad to find that some their products do not have fragrance or colorant. Yu Heng's favourite product is Freshel’s time-saving skincare range which is the All-In-One Gel Moisturizing Gel, which has a five-in-one concept in a unique gel formulation that quickly penetrates in just five seconds. Yu Heng who just got married recently said that the weather in Taiwan always changing and it affects her skin condition where she is now having combination skin type. Her cheek areas are dehydrated while her T-zone is oily. And she shared her beauty secret that in order to balance up her skin she apply an extra thick layer at night especially on her T-zone. And she felt that her skin condition has improved after using it for a few months. Freshel Perfect Gel Series comes in three formulas – whitening, hydrating and extra hydrating – allowing you to choose the most suitable formula for your skin. The thick & penetration formula delivers ingredients quickly. It serve as a lotion, essence, emulsion, cream and moisturizing makeup base. - consists double collagen and hyaluronic acid which will help to moist, smooth and increase elasticity of the skin. - consists of coenzyme Q-10, alpha lipoic acid, double collagen and hyaluronic acid. This is an intensive moisturizing care with an-anti aging skincare formula. Freshel has 4 types of Mineral BB cream which all consist of skincare ingredients. It can be served as essence, emulsion, cream, sunscreen and tinted makeup base. Comes in 2 shades natural beige and medium beige. -A smooth & non-sticky texture that will helps to reduce the visibility of spots. - A moisturizing mineral gel cream that spreads well and is absorb quickly by the skin to create a natural and beautiful finish. - An extra thick and moisturizing mineral BB cream that is rich in texture that covers visible skin problems. At the event also, we have a special preview of the new Kanebo Freshel CC Cream. Unlike the BB Cream, CC Cream stands for colour correction cream is a skincare cream that corrects visible skin colour tone by evening it out and reducing dullness. It's usually more watery, smoother, lighter feel compared to BB Cream. Although it can be removed with a regular face wash, I would always suggest to double cleanse the skin. Freshel CC Cream which comes with SPF20 PA++ has 5 functions all in one ie. essence, emulsion, cream, sunscreen and tinted makeup base. It also helps to camouflage dullness and skin colours to attain bright, natural skin without applying base makeup. It has moisturizing effect with double collagen and hyaluronic acid. Kanebo Freshel CC Cream is not available yet as this product would be only be officially launched in May 2014. She shared that besides using Freshel daily, she usually warmed up the products with her palm before she massage into the skin for better absorption. During the interview, Yu Heng told us that she is coming back to Malaysia this May for Freshel's event and I guess is the Freshel CC Cream launch. Freshel products are available in selelcted Watsons & SaSa store.